*Price per Endpoint for quantities 5-24. Quantity must be 5 or greater. *Price per Endpoint for quantities 25-49. Quantity must be 25 or greater. *Price per Endpoint for quantities 50-99. Quantity must be 50 or greater. Continuous behavioral monitoring of the client that helps create a complete profile of file activity, application & process activity, and network activity. This protects against both file-based and file-less malware and delivers a 360⁰ attack view with actionable intelligence relevant for investigations. Multiple layered signatureless techniques include techniques for protecting cloud intelligence, advanced static analysis and dynamic behavioral protection. They help protect against and remediate well known, little known, and even unknown malware, without regular scans or periodic updates. This maintains the highest level of protection at all times, without hampering user productivity. Unique roll-back capabilities support policies that not only remove the threat completely but also restore a targeted client to its original state, before the malware activity started. This removes the effort of manual restoration in the case of ransomware and similar attacks. Cloud-based management console reduces the footprint and overhead of management. It improves the deployability and enforceability of Endpoint Protection, irrespective of where the endpoint is. The size of your Capture Client tenancy is only limited by the number of endpoint licenses procured. Integration with the SonicWALL nextgeneration firewalls delivers zero-touch deployment and enhanced endpoint compliance. Plus it enables enforcement of deep packet inspection of encrypted traffic (DPI-SSL) by deploying trusted certificates to each endpoint. 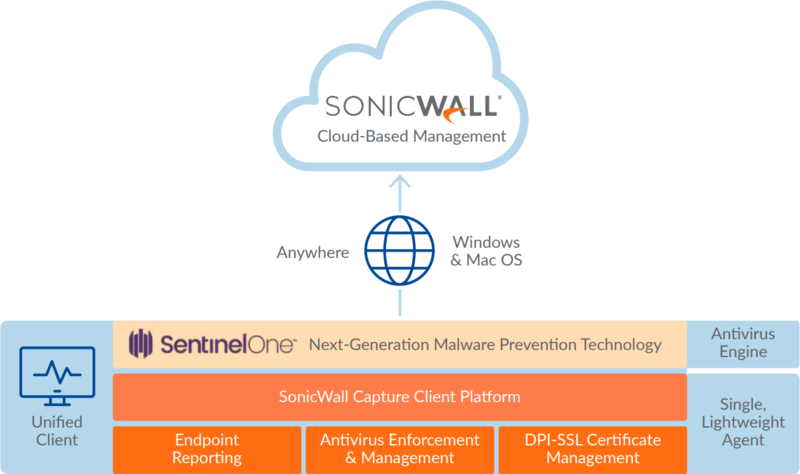 The SonicWALL cloud-based management console functions as a single pane of glass to manage all client policies, including next-generation malware protection, DPI-SSL certificate management, content filtering and VPN. The management console is a multitenant cloud-based platform offered at no additional cost. It provides client protection reporting and policy management, with support for fine-grain access control policies. These allow managed service providers (MSPs) to manage and report on clients of multiple customers. At the same time, each of those customers can only manage and report on their own clients. It also functions as an investigative platform to help identify the root cause of detected malware threats and provide actionable intelligence about how to prevent these from recurring. For example, an administrator can easily view what applications are running on a client. That, in turn, can help identify machines that may be running vulnerable or unauthorised software. 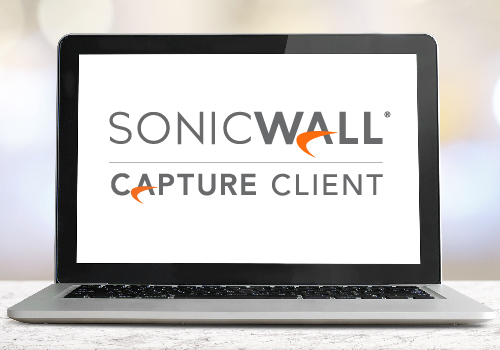 SonicWALL Capture Client Advanced delivers everything listed above for Basic, plus advanced rollback capabilities. Both offerings are available for Windows 7 and higher, as well as for Mac OSX. Capture Client has been updated with several new features and enhancements to improve its client protection capabilities. IMPORTANT: Capture ATP support is only available for Windows systems. Log into the Client Management Console as an administrator. Create or edit a threat protection policy. In Threats or Suspicious Activities settings, select Capture ATP (Auto-mitigation) option. Verify that the changes are saved. When the Capture ATP setting is changed, it applies to the client once the policy is updated on client side. NOTE: The settings under Suspicious Activities are only applied to the Windows client as suspicious detection is only available for Windows client. Enable or disable notification for the tenant. This option must be enabled for the other settings to take affect. Enable or disable notification for alerts from SentinelOne. Enable or disable notification for Client Management Console alerts for errors and warnings,. Enable or disable notification for client device logs based on level of log entry (warning, error, and so forth). NOTE: Only alerts having a priority of warning or higher are allowed to have notification configured. The whitelisting feature has been enhanced so that processes can be added directly to or deleted from the whitelist. It also includes an exclusion to the global whitelist. NOTE: Exclusions to the global whitelist may change the behavior of the clients connected to this tenant. Navigate to Protection > Devices. Click the Option icon (the gear icon) to the far right of the device name and select View Details. Select a process or set of processes. Click on Add paths to Exclusions icon. Verify that the processes were added to the global exclusions list by viewing Configuration > Exclusions. Select a process or set of processes to remove. Click on the Settings tab and select Remove Paths to Exclusions icon. Verify that the processes are removed from the global whitelist by viewing Configuration > Exclusions. The Group section (at Protect > People > Groups) has been completely refurbished to make a better distinction between static groups (which contains a static list of devices) and dynamic groups (where devices are added or removed based on rules). You can create a new static or dynamic list by clicking the + sign and adding users directly to the group. You can also create rules directly for the dynamic groups. Rules for static groups are disabled by default, but you can redefine a static group as a dynamic group. Select Make dynamic on the Rules tab at Protection > People. This feature adds links on the Threat page to the device that is infected by a threat. Navigate to Protection > Devices to see the infected device; it is displayed with the highest severity icon (red). Expand the row of the infected device to see the number of threats detected. Click on the threat to see the details. Whenever threats are detected on the user endpoints, a notice is displayed to the system administrator and to the user of the device. Alerts can be detected on mac OSX, Windows 10 or Windows 7. The Trusted Certificates option has been enhanced for using Firefox. You can set the options so that certificates can be added to the Firefox certificate store. Alternately, you can configure Firefox so it trusts Windows certificate store and/or trusts the macOS keychain. *Price per Endpoint for quantities 100-249. Quantity must be 100 or greater. *Price per Endpoint for quantities 250-499. Quantity must be 250 or greater. *Price per Endpoint for quantities 500-999. Quantity must be 500 or greater. *Price per Endpoint for quantities 1000-4999. Quantity must be 1000 or greater. *Price per Endpoint for quantities 5000-9999. Quantity must be 5000 or greater. *Price per Endpoint for quantities 10000 or more. Quantity must be 10000 or greater.